In 2005 German author Daniel Kehlmann wrote a historical novel Die Vermessung der Welt. The novel is a fictitious biography of the German mathematician Carl Friedrich Gauss and the German geographer Alexander von Humboldt. The book was a bestseller with 2 million sold copies now and it has been translated in 40 other languages. Doing an adaptation for cinema was just a matter of time. The well known German director Detlev Buck (Same same but different) step up to the plate and made a virtually stunning „biopic“ about two great explorers which contains lots of passion, love, history and progress. Buck also wrote the script for this movie together with Daniel Kehlmann. Detlev Buck made a visually stunning 3D adaptation which tries to tell the stories of two different lifes. Sometimes it seems the film has not enough time to show all the interesting facets from both protagonists. Its more important to show all the beautiful landscapes, animals, plants and people. No wonder that the development of both characters is fading off the spotlight from time to time. While the book describes the passion that two people feel when they are following their passion for nature and mathematics, the film loses itself in a stringing together of fragmentary lifetime episodes. We don’t get what is the real bond between the both figures. Of course, they lived at the same time and did extraordinary things for science. But the film renounced a deeper view of what it means to put academic curiosity over human relationships or needs. The film just offers some glimpses of Gauss’ longing for someone who shares his conceptions entirely. Alexander von Humboldt tries to reach his own humanistic and ethic ideals and forgets what it means being a human instead of. He sees himself more like a machine which always has to work. The usage of 3D technology is the big advantage in this movie. We see beautiful landscapes and exotic flora and fauna. It is almost as if we range personally with Alexander von Humboldt the jungle and would explore all the fantastic nature. 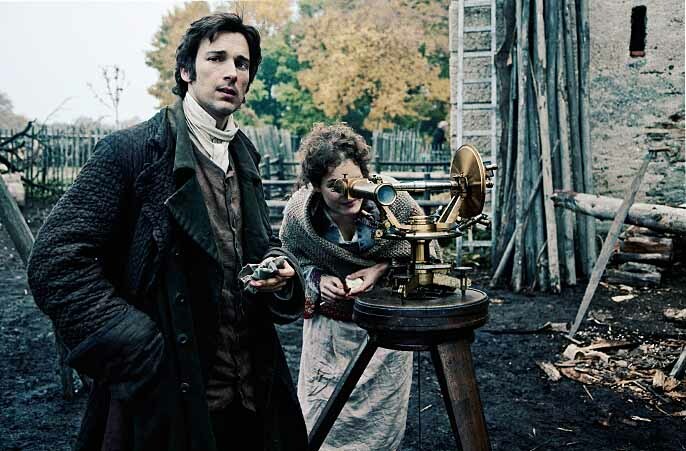 Die Vermessung der Welt is an entertaining fictitious biopic about two great scientists with opulent pictures and Buck typical kind of odd humor. The downer is the lack of deepness in the elaboration of characters.